A gorgeous and massive Pacific cyclone is spinning away off the coast of the western United States, as seen in pre-operational satellite imagery from GOES 17 (below). This broad storm system is forecast to move northward as it impacts the west coast and moves inland, so northern Utah looks like it will miss out on most of the precipitation associated with this system at this time. However, current model guidance does show that as it treks inland we could see some light accumulations as the brunt of it skirts to our northwest on Thursday, but uncertainty still remains. 2 p.m. MST view of the cyclone in the Eastern Pacific courtesy of GOES 17 pre-operational imagery. Click the picture for a current view. SREF plumes for Alta Collins showing the end of today’s snows and the chance for some light precipitation on Thursday the 10th. From weather.utah.edu. Good news is that we are sitting near normal for accumulated precipitation and for snow water equivalent of the snowpack (SWE) based on most SNOTEL stations in Utah. These exclude any additional precipitation since the beginning of the day today (which was about 0.5″ of water in the upper Cottonwoods). SNOTEL snow water equivalent values as a percentage of median of the period of record (1981-2010). White dots are 100% of median value, while oranger colors are slightly less than median and greener dots are slightly more than median. Click for updated conditions – under Snow, click Stations Only (updated daily). Not looking too shabby! Same as above, except this is total accumulated precipitation at SNOTEL stations since October 1, 2018 as percentage of normal for the period of record (1981-2010). 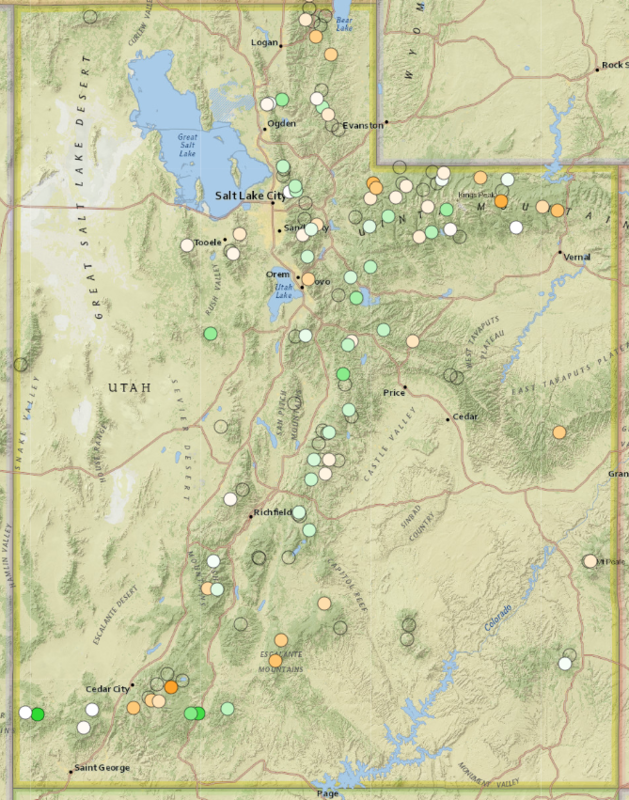 Most of the SNOTEL sites in the state are reporting slightly above normal precipitation for Water Year 2019 so far, but we have many more months of accumulation to go. More good news is that it isn’t looking like an extended break from storms. We shouldn’t have to deal with too much pollution buildup this week, as inversion conditions that set up don’t appear to be too strong or prolonged. Our next period of active weather has potential to begin after this coming weekend, around the 15th of the month. Be safe out there whether in-bounds or in the backcountry with this new snow and wind – some dangerous avalanche conditions exist! 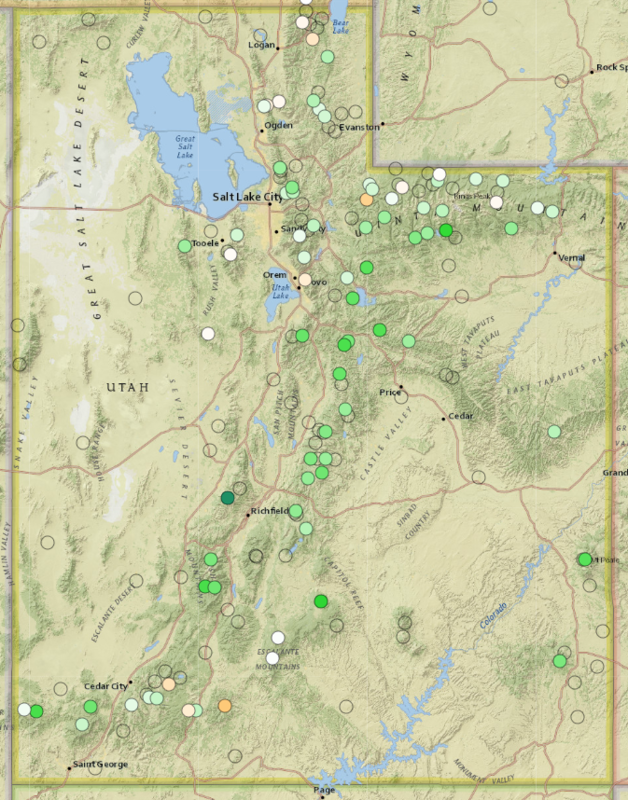 Check out avalanche forecasts & observations at the Utah Avalanche Center (https://utahavalanchecenter.org/) before you go, and check back with us in the coming days to get updates about Thursday’s snow amounts and potential for mid-month precipitation.